It’s day 2 of the countdown teasers for Clearly Besotted and today’s card features the very cute Woodland Plushies set. 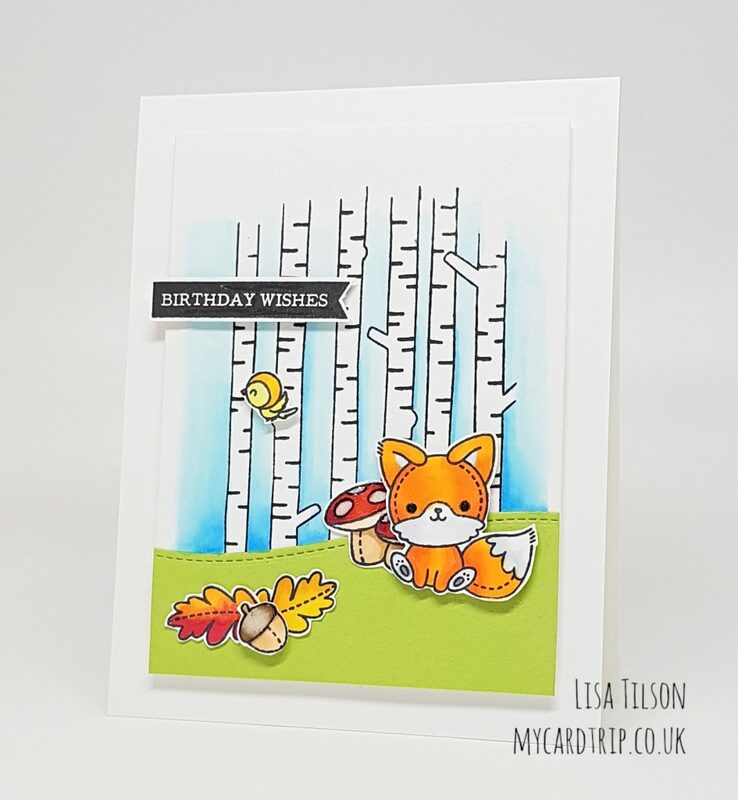 This is one of the larger sets and features several woodland critters and lots of little additional stamps to create your scene. To start, I stamped and coloured a whole load of images from the set with Copics, fussy cut them out and set them to one side. There will be coordinating dies available if you prefer not to fussy cut :). I often colour a lot of images up at the beginning if I haven’t decided on a design, and then I can play around with them once I start the card. To create my little scene, I took the Into the Woods stamp set and stamped this with Memento Tuxedo Black ink onto some Neenah 80lb cardstock which I had already trimmed to a smaller panel (3.5″ x 4.75″). Next I took a strip of green cardstock and die cut this with a stitched hillside border die, adhered it to the scene panel with DST, and trimmed off the edges. I coloured the sky around the trees with Copics and then spent a good 20 minutes playing around with various images trying to decide on my layout! I went with the fox in the end as the main feature as I liked the orange against the green and blue. But there are so many cuties, as always, it’s hard to pick! The mushroom was adhered flat onto the panel as were the two leaves. The fox and acorn were popped up with foam tape. I added some glossy accents to the mushroom tops and the acorn top and some shimmer to the leaves. I also used my black glaze pen to add a little dimension to the Fox’s eyes. At the last minute I felt I needed one more thing – a bird! So, I stamped and coloured the bird from Fairy Tale Princess and popped that up with foam tape. Lastly I stamped the greeting from Flag It using Versafine Onyx Black ink and trimmed it with a little white border. The scene panel was added to a base with foam sheet behind and then the sentiment popped up at the end. I really liked how this turned out and you can never have too many birthday cards! 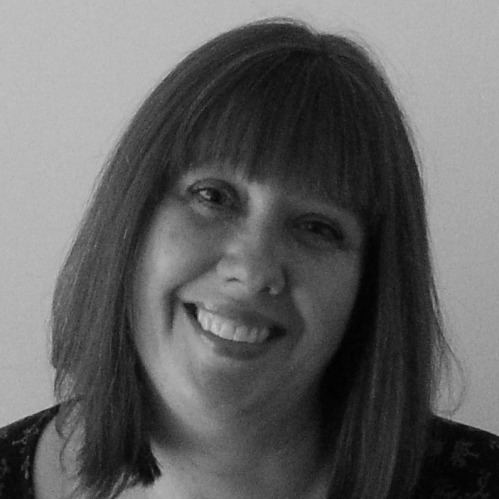 It would be lovely if you could hop over to my super talented teamies, Stephanie, Keren and Michelle and see what they have to tease you with today. I will be back tomorrow with the third teaser for you. In the meantime, thank you for coming to visit and happy crafting! Adorable card! Love that cute fox! that’s adorable. i’m becoming enamored with their stamps. i just got the Got Your Back set, because my daughter adores meerkats. Your card is absolutely adorable !! 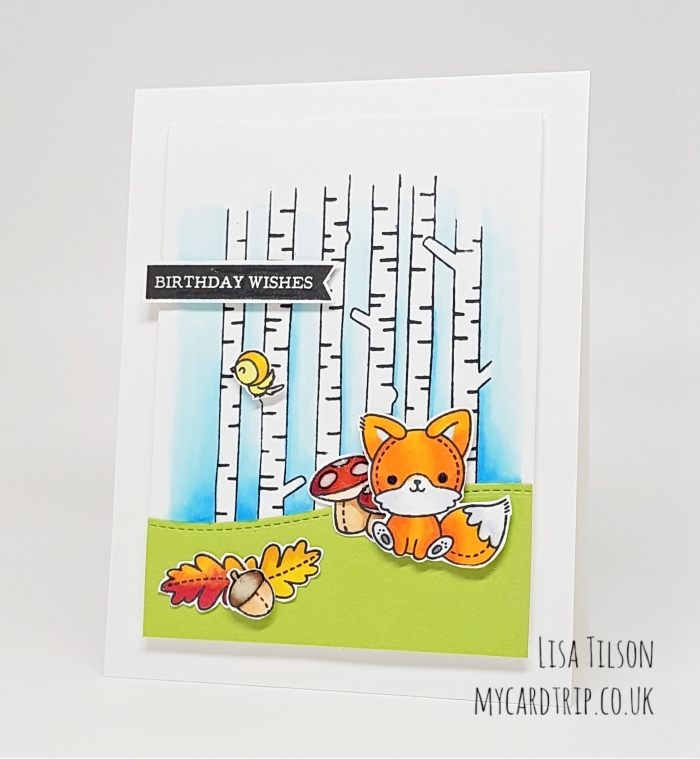 Oh Lisa this is so adorably cute, your colour work is fantastic, if this fox is this adorable I can’t wait to see the others on this set. Thank you for sharing such a great card image. What a lovely birthday card Lisa. The characters always look so cute and I can’t wait to see what you bring tomorrow.